Practical, tested, implementable real-world advice for transforming any business and is written by people that have been there and done that. Changing an organization is tough. Transformation is hard work that should not be attempted by the faint of heart or the weak of mind. But transformation is not rocket science either. By taking a realistic, simple and direct view of what is required to transform an enterprise, the authors reduce the noise and nonsense that surrounds much of the discussion of transformation and provide straight forward lessons, examples and thought provoking questions to guide the listener to a more powerful position as an agent of change. 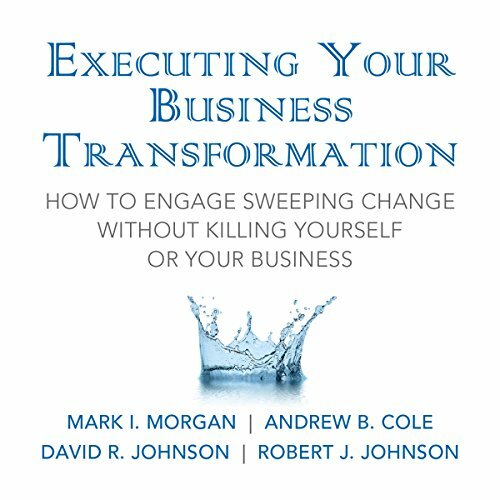 Based on the authors' decades of experience dealing with major business transformation, this book provides valuable guidance for any company engaged in large scale change brought on by shifts in the competitive landscape, mergers, acquisitions, or a major restructuring of their business model. Many organizations undergo transformation with lots of enthusiasm, but are frustrated with the results. This book contains a set of lessons gained in the process of working in and with organizations in the process of transformation. The book starts out by framing transformation and explains the overall system the enterprise that is involved in transformation. By doing so, clarity is brought to the question of why change is so difficult and problematic. A way of looking at transformation that is comprehensive and yet manageable without all the buzzword bingo terminology. 11 critical lessons taken from the authors broad experience on a broad range of topics that you can leverage in your situation. To get some thought provoking insight from 10 key questions for each lesson that you can use to apply the lessons to your organization. A comprehensive framework for leading transformation that will challenge your thinking and provide a path forward to taking immediate action. With rare insight and candor, the authors provide thoughtful advice backed by examples from their comprehensive experience. If you don't like transformation, you are going to hate irrelevance. This book is your best bet for getting the insight you need to transform your organization before it becomes irrelevant. ©2010 John Wiley & Sons, Inc (P)2012 Audible, Inc.